Posted April 21, 2014 by laurielmorrison & filed under Author Interviews, Student-Author Interview Series, Teaching, The Writing Process, Young Adult Literature. Welcome back for the fourth installment of the Student-Author Interview series! This time, I’m excited to feature Trent Reedy, a fellow VCFA alum and a prolific author who writes brilliantly across genres. Trent was a member of the Iowa Army National Guard and served in Afghanistan. Trent’s first published novel is Words in the Dust, a powerful middle grade story that honors Zulaikha, a girl he met during his time in Afghanistan. He then wrote a second middle grade novel, Stealing Air, before making his young adult debut with Divided We Fall, an action-packed novel that kicks off a thrilling trilogy and takes place in the US in the near future. 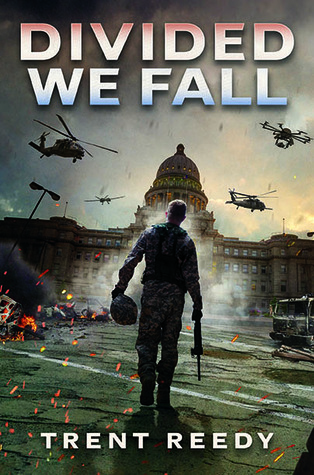 In Divided We Fall, seventeen-year-old Danny has no idea what he’s getting into when he joins the National Guard. Danny is looking forward to spending his senior year playing football and hanging out with his girlfriend, but he finds himself in the middle of a major conflict that ultimately sets the stage for a second US civil war. 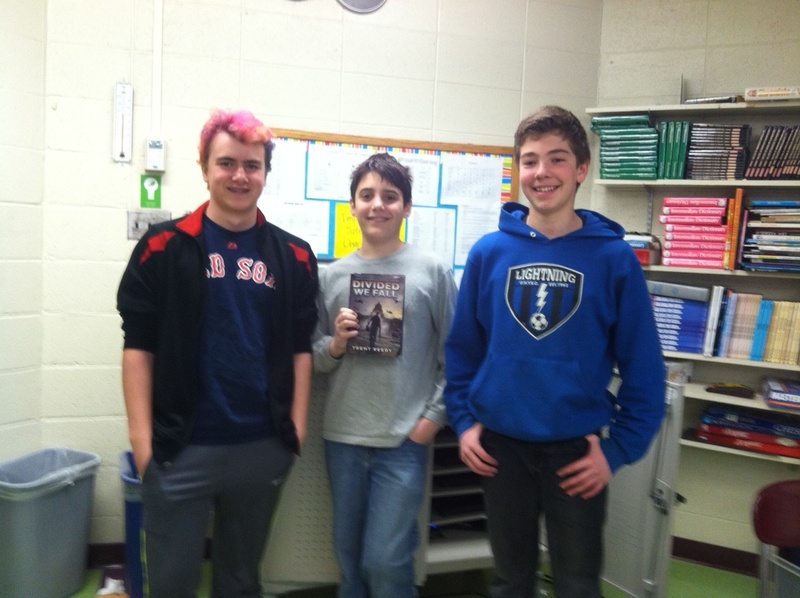 Three 8th grade boys—Saras, Jake, and Jacob—read Divided We Fall and had some questions for Trent about how he came to write this thought-provoking book. Jake: I really like all of the action. It felt like I was there right with Danny, especially during the fighting. I also like how Trent incorporates blurbs from the news throughout the book. The blurbs give a good idea of what’s going on in the big picture and show the conflict among American citizens. I thought those blurbs were really unique—I’ve never read a book that had something like that. Trent: Thank you for your kind words. I’m glad you enjoyed Divided We Fall. As I write this, I’m also hard at work on book two in the trilogy called Burning Nation. This book should be out in early 2015. The blurbs you mention are what I call “media noise” sections. I think they come in handy getting a very big national story across to the reader even though the story is told from the point of view of Danny who doesn’t care about big national stories that much. Saras: I liked that there were so many feelings in the book but they often weren’t stated right away—you had to figure out how Danny was feeling rather than being told. I also liked that Danny had conflicted ideas and didn’t know what he should do so often, and I liked the Facebook-like posts that are incorporated and how you could see how many stars people’s comments got. Trent: Saras, you bring up a good point about Danny’s conflicted ideas. From the very beginning of my work on Divided We Fall I was determined to make a story in which not only the main character would be conflicted, but where the reader would also be a bit unsure of the right or wrong answers in several of the difficult situations. I hope I’ve portrayed a fairly complicated scenario that readers will enjoy puzzling out for themselves. Jacob: What I liked best is how everybody in the community has conflicted ideas, but people still come together and Danny’s friends have his back, even when they are shocked about what’s going on and might disagree with him. It’s interesting to see who is backing him and who isn’t in the blurbs and news stories, too. Trent: You bring up a great point, Jacob. I wanted Danny to have a rock solid group of friends. I remember really enjoying that sense of loyalty, and a family-like friendship among many of the characters in the Harry Potter series, and I wanted to bring that sense of friendship to my own series. I wish I had been blessed with such a great close group like that when I was growing up, but I’m glad I didn’t have to deal with all Danny must deal with. Jake: How did you come up with the idea for this particular book? It seems like there are lots of things you could have written about involving the army, so what made you choose to set your story in the near future and have the country be on the verge of civil war? Trent: Jake, I wish I had a good answer to your question. The idea for Divided We Fall slammed into my head one day while I was driving. Usually, I have to kick an idea around in my mind for a long time, maybe for years before I start writing. But one day I just thought about a teenage Guardsman assigned to pull guard duty on the state line between Washington and Idaho. For the next several hours, I could think of nothing else but circumstances that would make that state line standoff happen. That very day when I returned home, I started writing the first lines of the book. That almost never happens for me. As I said, most of the time, an idea has to hang around in my brain for a very long time before I start writing. But I also wanted to write about a country on the verge of civil war because I’m troubled by a lot of the things I read about in the news. It seems like America is divided more now than it has been at any other time in my life, so it has been good exploring those concepts through the course of my work on the trilogy. Saras: Why did you choose to set the book in Idaho? Trent: I set the book in Idaho because, in general, Idaho is a fiercely independent-minded state. It is a state where many people are passionate about preserving their rights to own and carry firearms. More importantly, to make this story work, I needed a state where the geography provides some natural defenses against invasion. Idaho has some beautiful and rugged mountain terrain. I knew this would be important when my fictional Idaho National Guard set up its blockade to keep federal soldiers out. So I chose Idaho for several reasons, but the most important one was the state’s geography and topography. Saras: If you wanted to write about a soldier, why did you choose to write about a high school student and not an adult? Trent: I wrote about a high school student, first, because I find the growing up years to be the most interesting. Adults are boring! Also, there is this idea that young people are supposed to be mostly at peace, going to school, having fun with their friends, and all that. So putting this young person Danny Wright into the middle of this huge near-war feels even more jarring than it would have, I think, had I made the story about an adult soldier. Jacob: Did you think of memories from your time in Afghanistan while you were writing this book and did your memories help you write this book? Trent: Jacob, I have been home from my time in the war for about ten years now, and honestly, not one day passes when I do not think about it. I’m trying to move on, to leave the war behind, but it’s been really tough. Certainly my military experiences helped writing this book. I hope my knowledge of weapons systems and military culture come through in Divided We Fall. Also, during my time in the war, I spent a lot of time on guard duty. I tried to convey what that felt like when I put Danny on guard duty. Jake: Do you like football, and if not, why did you make Danny a football player in the book? Trent: I have a complicated relationship with sports. I was terrible at football in high school, but I do enjoy watching a good football game now and then. I put it in the book because I wanted to establish Danny is pretty tough. Also, as I said, football is pretty exciting, and anything can happen on any given play. It has a lot of potential for drama, which is what you want in a book. Jacob: What can you tell us about the next two books in the trilogy? Trent: The next two books are intense! I’m closing in on finishing Book 2, called Burning Nation. As you may have guessed it is all about a civil war, and the characters don’t get through it without serious cost. The third book will be called The Last Full Measure. I have a lot more work to do on that book, but it is going to bring the whole story to a surprising end. Saras, Jacob, and Jake: Who is your favorite author? Are there any authors or books that have especially influenced this trilogy? Trent: Wow. This question is very hard to answer. Who is my favorite author? Maybe Katherine Paterson because her books are amazing and really helped me out when I needed help. Katherine is a wonderful person. I read most of the YA dystopian books to prepare for writing Divided We Fall. I enjoyed The Hunger Games, Divergent, Legend, and books like that. I read those books to see how other writers dealt with a society that was holding on after the systems and rules that we now live by had collapsed. Jacob: Was your decision to join the National Guard anything like Danny’s? It seemed like he joined because he wanted to be like his father and he thought being in the National Guard would help him with other things, like his mechanic job and football training. Did you also join because you thought being in the National Guard would help you do other things, or did you mostly want to be a soldier? Trent: I joined the Iowa Army National Guard because my father was working hard and helping to pay for my college tuition. I wanted my dad to be able to keep more of his money, so I joined the Guard to pay for my school myself. Actually, I never dreamed I’d be a soldier before I wanted the tuition money. I’d always wanted to be a writer. That’s what it has all been about. It turned out my time as a soldier helped both with college and writing. Jake: Was it your plan to join the National Guard back in 8th grade? Trent: I did not plan to join the National Guard until after my second year of college. When I was in 8th grade, I wanted to be a writer. Saras: Did you plan on being a writer when you were in 8th grade? Trent: I wanted to be a writer since I wrote this one fun short story when I was in the fourth grade. Writing is all I’ve ever wanted to do. It is the best job in the world! Trent: There was never really anything else I wanted to do besides writing. I earned a teaching license, and was very involved in the rigorous demands of teaching high school English for four years, but during that time I was always working on my fiction or attending writing school at the Vermont College of Fine Arts. For many many years now, it’s been all about the books. Thank YOU, Trent, for these thoughtful and fascinating responses! We’re looking forward to the rest of the trilogy! I love these interviews!!! Great questions from your students, Laurie. And Trent’s responses were so gracious. Glad to know he’s hard at work on the next book of the series. A fabulous interview by Saras, Jake, and Jacob! I loved every bit of it. Thanks to them, Trent and to you too, Laurie, for organising it all!